The Rosenblum Companies is excited to announce that starting March 21, 2016, 9 Miles East Farm, a local farm and food business, will provide weekly delivery of healthy, ready-to-eat prepared meals at Great Oaks Office Park using high-quality ingredients, including vegetables from their own fields. 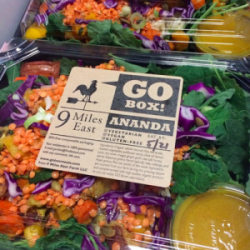 “Go Box” lunches cost less than $9 and consist of fresh vegetables, whole grains, proteins, fresh greens and farm-made dressings. “Dinners to Go” are family-size meals and soups incorporating high-quality local ingredients. A four-serving portion, salad and side dish costs $25. Vegetarian, vegan, and gluten-free options are available. No pre-order or subscription required. You can also opt to receive a weekly menu in your inbox by clicking here. More reasons to love 9 Miles East? The dishes are compostable! Here’s why that matters: Compostable products must break down at a rate similar to paper or disintegrate into small pieces within 90 days so that the original product is not visually distinguishable in the compost. Promoting sustainable choices like this is how Rosenblum offers healthier, more economical places to live and work.